In most CT scan studies begin with one or more localizer images. These images are not cross sectional in nature but rather they are very similar to images acquired with conventional radiographic projection techniques. Because localizer image are not cross sections it is not necessary to rotate the xray tube during their acquisition. The localizer scans are digital image acquisitions that are created while the tube is in it stationary position and the table moves through the scan field. The single projection causes anatomic structures to appear superimposed, like those depicted by conventional radiography. Compared with conventional radiography images, CT scan localizer images are of slightly poorer in image quality and deliver an approximately equal radiation dose to the patient. The position of the tube determines the orientation of the image. Like for example, if the tube is positioned above the patient, the resulting localizer scan will be an anterior – posterior AP view. such as the localizer image of the chest and abdomen in (B). 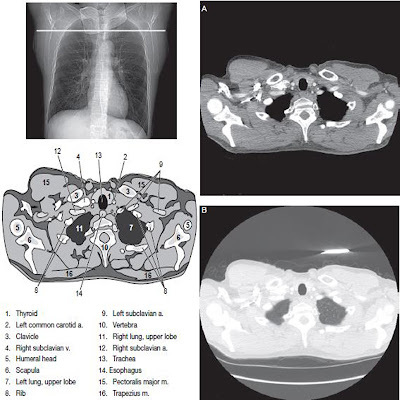 the localizer image of the chest and abdomen in (B). Whereas positioning the tube to the site of the patient will result in a lateral view. These name have all been used to describe the image. In all routine studies, at least one localizer scan is acquired. The optimal scout includes all areas to be scanned and therefore ensure that the anatomy to be imaged has been placed within range of the system. As an example a patient may lie out of the scanning range if he or she is positioned too close to the ends of the scanning table, a problem that can be detected using localizer images. In addition to correct positioning on the table in the head- foot first or the z axis direction, the patient must also be centered appropriately in the gantry in both x and y directions. Miscentering a patient in either x or y direction can result in out-of-field artifacts. Miscentering in the x direction occurs when the patient lies more to one side of the table. Miscentering in the y direction occurs when the radiologic technologist sets the table too low or too high within the gantry. Proper centering is also imperative when automatic exposure control techiques are used. Miscentered localizer scans can lead to erroneous calculation of the tube current and can affect image quality and the radiation dose to the patient. On all CT scan machine it is imperative that the operator input the correct directional instructions before data acquisition is initiated. Therefore, before the localizer images are obtained it is necessary to indicate whether the patient is placed head or feet first into the gantry and whether he is lying supine, prone or in decubitus position. If the operator accurately enters this information in the system, the software correctly annotated the localizer image and all subsequent cross sectional images as to left-right, anterior-posterior and superior-inferior orientation. Conversely, incorrectly inputting any direction instruction in the computer will incorrectly annotate all subsequent images in the study and can result in misdiagnosis and serious medical errors. obtaining the localization scan. Because the patient was incorrectly identified as being prone on the table, when she was actually supine, the right and left labels are reversed, both on the scout image and on all subsequent axial images taken using that scout as a reference. Notice that on the axial image the anterior-posterior annotations are also reversed.